‘SATURDAY NIGHT SHOW’ host Brendan O’Connor has been speaking about the prospect of Ray D’Arcy taking over from him, amid continuing speculation that the former Today FM host is being lined up for a weekend show. The ex-Den presenter has signed up to present new TV projects at the national broadcaster as part of his contract following his move from the commercial station last December. He’s been repeatedly linked with an ‘Ant n’ Dec style’ evening entertainment show in reports recently — however, D’Arcy himself told the RTÉ Guide it wouldn’t be something he was interested in. “When I was in my 30s I would have aspired to doing something like that, but, no, absolutely no desire now,” the presenter said. Whatever about an ITV-style entertainment show, a weekend chat show still seems the most likely destination for the popular host. That might require unseating O’Connor from his slot. Not a prospect the Cork journalist would relish, he told Radio 1′s John Murray this morning — but he expects to be told one way or another after chat show’s current run. “I did see that Ray D’Arcy is going to present an Ant n’ Dec style show instead of the Saturday Night Show. Yeah. Sounds good,” O’Connor dead-panned. Before he began his tenure presenting the show, he told Murray, he would “certainly never have expected to last five years, because I would have presumed I would have done something majorly disastrous at this stage, and we would have been pulled off the air in some kind of national scandal”. We came close to few of those along the way but survived this far. “It’s been a great five years. Equally, I would say that I think our numbers are up hugely on last year. I think that’s very unusual in television at the moment. “I think the thing is firing on all cylinders at the moment and I think, you know, there’s a lot more we could do. But, you know, whatever they decide in their wisdom. If Ray D’Arcy doing an Ant n’ Dec style show is what’s required, well sure look they’ll decide, and I’m sure I’ll find out at some stage. 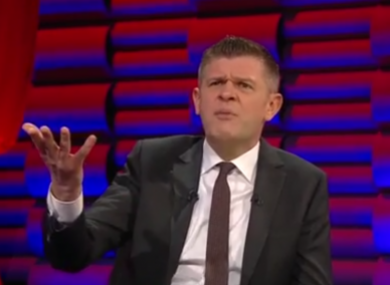 Meanwhile, Ryan Tubridy has also been speaking about the mooted weekend reshuffle, this week, telling the Indo: “Brendan O’Connor is the presenter of Saturday Night and I haven’t heard anything to the contrary on that front”. Email “"If Ray D'Arcy doing an Ant n' Dec-style show is what's required, well sure look they'll decide"”. Feedback on “"If Ray D'Arcy doing an Ant n' Dec-style show is what's required, well sure look they'll decide"”.